The predictable result was a series of comments calling Dr. Paul Offit a variety of names and wishing a variety of harms on him. As of seven hours from the post going up, comments calling Dr. Offit “a self serving creep who gets a bully pulpit to promote his personal financial interest,” “jerk”, “downright evil”, “a disgusting psychopath”, and other outlandish comments were not moderated by Dr. Sears or anyone else. 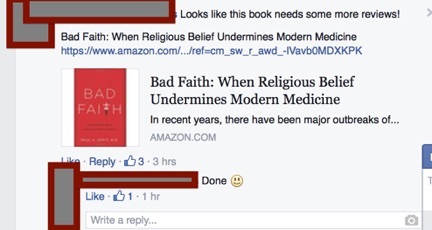 Another comment asked people to post reviews about Dr. Offit’s book on Amazon. Two reviews were placed there showing clearly the commentators have not read the book, both including personal attacks. Those two comments were also left in place. He did not, however, remove the attacking comments. 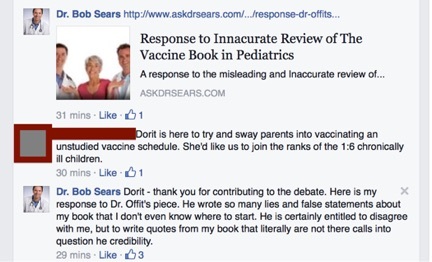 Attacks on Dr. Offit are a regular staple on other anti-vaccine sites. NVIC periodically puts up a picture of Dr. Offit – whether or not it has anything to do with the article accompanying it – and allows its followers to engage in substantial abuse with little moderation (in at least one case, death threats were left up until a request to remove them was sent to the central organization. Age of Autism regularly publishes articles attacking Dr. Offit and allows its members to launch vicious personal attacks against him. 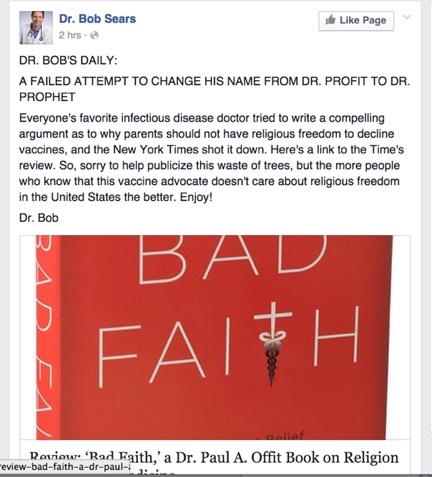 If Dr. Bob really wants to claim he’s not anti-vaccine – as he did in previous posts – following in these footsteps is a bad idea. It is also unprofessional. Dr. Sears does not like the fact that Dr. Offit criticized his book (Dr. Offit and Ms. Moser’s criticism can be found here; Dr. Sears’ blog post written in response can be found here). But allowing his anger to lead him into childish name calling, and allowing his followers to post the kind of comments typical to extreme anti-vaccine sites does not fit his claims of not being anti-vaccine. It’s also extremely unprofessional. There are ways professionals criticize. This isn’t one of them. Dr. Sears’ behavior in the past was problematic. In the middle of an outbreak, he misrepresented the risks of measles, downplaying them in ways that were simply misleading. His book, too, by playing into parents’ fears and providing inaccurate information, could mislead parents into not vaccinating, or at least skipping or delaying vaccines. And in recent times, Dr. Bob Sears’ calls for action against the pending legislation in California (SB277) focused on directing people to anti-vaccine organizations like NVIC. Update – a personal attack using an epithet coined and used by anti-vaccine activists against another pediatrician, unleashing and allowing a series of invective-filled, hostile comments left unmoderated – Bob Sears behavior fits comfortably with that of the anti-vaccine movement. The fact that he felt comfortable to engage in it also suggests he sees his frame of reference, and his support base, as belonging squarely in the anti-vaccine camp – and not its moderate edges. Editor’s note – this article was first published in October 2015. It has been updated to fix broken links and update current information.